Dusky MacMorgan is a former agent for the CIA. 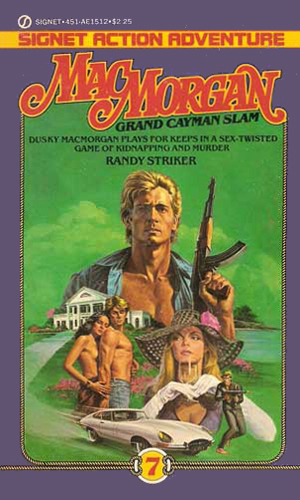 A pseudo-spy series that accurately billed itself for what it truly was, namely an action adventure series, the tales of Dusky MacMorgan are pure excitement. 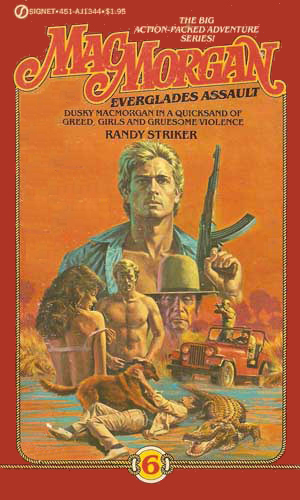 .It was obvious that the purpose of the series was to give the reader one heckuva ride and it delivers. But more than that, it also gets deeper into the character than most in this sub-genre and it leaves you knowing and liking the hero very much. I used the term 'pseudo-spy' because MacMorgan works unofficially for a 'secret government agency' doing special jobs that his real life work as a charter boat captain can masquerade. The agency is not specifically named but the man who recruited him was previously a CIA agent so MacMorgan assumes that is the one. MacMorgan is a hulk of a man, good looking with blond hair sun bleached almost white. An ex-Navy SEAL with three tours in Vietnam on his record, he moved to the Florida Keys after discharge and bought his own boat. Life rewarded him with a wonderful former actress wife and twin boys but then took them away when they died in a car bomb explosion meant for MacMorgan. Anxious to get even with the murderers, he accepts the offer Norm Fizer of the government agency of a role in breaking the illegal activities of a U.S. Senator gone bad. After that case is concluded satisfactorily (in the first chronicle), he is told by his friend that he would be contacted from time to time to help again. He readily agrees. The seven adventures of MacMorgan all take place in the Caribbean, an area the author knows extremely well. They are extremely good at capturing the flavor of the sea, the music, the food, and the people who live there year-round. The activities that attract his attention are exciting and highly entertaining, though the espionage aspect is usually secondary. As I read this series, I couldn't help but feel a remarkable closeness of this one to two other series I much admired. 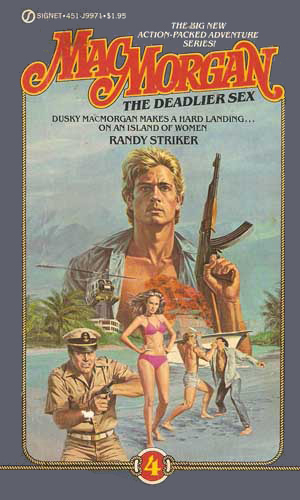 The first is the Matt Helm series of spy books and the other is the Travis McGee adventure series. By no means would I consider MacMorgan to be imitative, just similar and of a quality high enough to warrant such praise. When his best friend is killed by drug runners stealing his boat, MacMorgan chases them down and kills or captures the group. In retribution, the gang, working for a Senator, destroys Dusky's family, prompting him to join after the entire outfit. 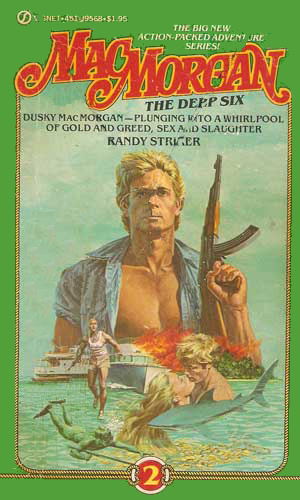 While MacMorgan was more interested in finding what happened to a harmless old treasure hunter, Fizer entices him to concentrate on a group of Cubans operating off the keys. 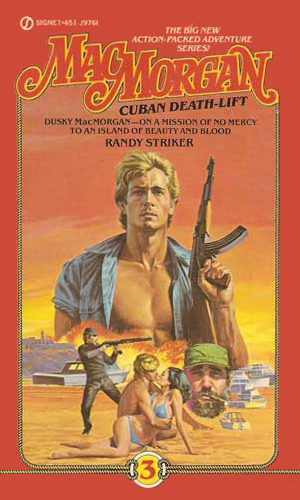 Three CIA agents head to Cuba to use the confusion of the Mariel Boat Lift to learn more about the Castro regime but then disappear. MacMorgan is sent in with a beautiful female agent to make sure they are not actually out to eliminate the Cuban. 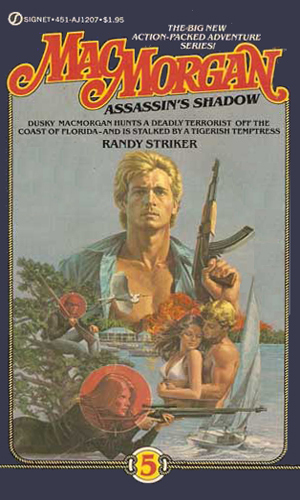 When Fizer asks MacMorgan to look into what seems like a war between two drug running gangs, he comes upon an island of women escaping from abusive homes and maybe involved in the destruction of several small ships. An international band of terrorists is starting to make a name for itself as it takes on the assassination of a top Israeli diplomat on vacation in the Keys. MacMorgan's mission to stop them is complicated by the disappearance of his friend Fizer. Taking some personal time, MacMorgan agrees to help an old friend whose family home site in the Everglades is being threatened by developers and an ancient creature known as the Swamp Ape. When the British government asks a friend of MacMorgan, also in the Intelligence business, to recover a kidnapped child, he asks for Dusky's help. They have three days to recover the boy before all hell breaks loose. This adventure series is a might low on the cloak and dagger but it is richly filled with atmosphere, excitement, great characters, and darn good plotting. It doesn't pretend to be Shakespeare but it hooks you just the same. In the About section, I commented on the similarity to Travis McGee and I cannot stress that strongly enough. 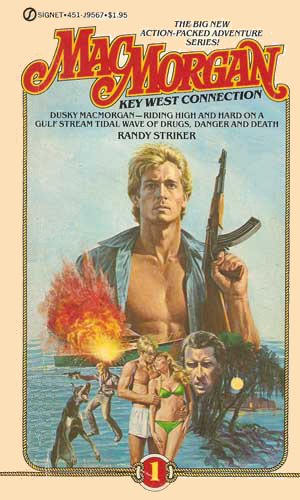 It has a lot of differences except that it captures the feel of the Florida Keys and the people who live on the water. It also presents a terrific character who is unique enough to be memorable without trying for superhero. I devoured these seven adventures and wished there had been more. Luckily, the author's real name is Randy White and, while he is not creating any new MacMorgan adventures, he is writing another excellent series called Doc Ford. Give them a try, too.